Kiruna Church and bell tower. Kiruna is sinking, literally. Sweden’s northernmost town located in Swedish Lapland, a remote area with a harsh climate within the Arctic Circle, came to be because of the rich iron ore being mined nearby. The same mine that brought the people and the town and the money is what is now causing the town to sink. The situation isn’t a complete disaster, and it isn’t a surprise either. When LKAB, Kiruna’s mining company, was founded in 1890, the founder ran the calculations and knew that if the mine continued, the town would have to be moved in 125 years. That time has come and Kiruna needs to move. You may be wondering why a mining town that is slowly sinking is a sought after tourist destination. Kiruna is a popular place to visit for people who are traveling to Swedish Lapland to enjoy outdoor winter activities like snowmobiling, dogsledding, and seeing the Northern Lights. While Kiruna is oftentimes used as a home-base for enjoying outdoor activities, the town itself has something to offer visitors to this remote part of the world. The main attraction is the mine, which travelers can visit on a guided tour. There is also Kiruna Church, a wooden church voted the most beautiful public building in Sweden, and Kiruna’s city hall, with its unusual clock tower. After the city’s big move, some of Kiruna’s attractions will still be in the same place, some will be moved, and some will no longer exist. A visit to Kiruna should include a tour of the mine. After all, the town wouldn’t even be there if it weren’t for the mine. This isn’t your gold rush era old-timey kind of mine like we visited on Arizona’s Apache Trail. This is a modern, working, underground city kind of mine. Entrance to Kiruna's iron mine. The LKAB mine is the largest underground iron ore mine in the world. It can only be visited on a guided tour which is set up through the Kiruna Lapland tourism board. (For tour times and to make a reservation, visit Kiruna Lapland’s website.) A bus picks everyone up from the Tourist Office in Kiruna and drives them to the nearby mine. Once the bus enters the cave-like entrance, the bus begins winding its way down, down, down into the bowels of the earth. Schematic of the mine's tunnels. The roads inside the mine are called slopeways. There are 400 kilometers of slopeways within Kiruna’s mine. The levels of the mine are named after their depth. For instance, Level 540 is 540 meters down and is one of the main levels from 30 years ago. A restaurant for mine workers is 1,365 meters underground, and the deepest point of the mine is 1,545 meters. Equipment used in Kiruna's iron mine. The tires are filled with water. After donning hardhats, the tour starts deep in the mine with a short film about the mine and the company. The tour then walks through the level where mining equipment can be seen and the mining process is explained. You can even take home a baggie of iron ore pellets, which is the form in which most of the iron from the mine is distributed. One day of mining produces enough iron to build six Eiffel Towers. In case you’re wondering how an entire town can afford to move, LKAB will pay for the move. LKAB is one of the most profitable companies in Sweden. There are a few things to do and see within the town center of Kiruna as well. One of the top things to see in Kiruna is Kiruna Church. Kiruna Church is not your standard church. 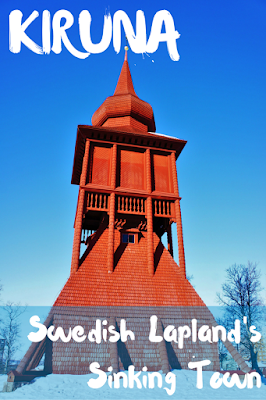 It is a wooden church built in the shape of a Sami tent, or goahti. Kiruna Church was designed by Gustav Wickman and was built between 1909 and 1912. When the church was completed in 1912, it was donated to the people of Kiruna by LKAB mining company. In 2001, the church was voted Sweden’s most beautiful building. Kiruna Church is in the center of town. It is one of the buildings that will be saved and will actually be moved to a safer spot. Interior of Kiruna's City Hall. Another must see in Kiruna is Kiruna’s City Hall. This is a spacious building topped with a very unusual clock. Kiruna’s current City Hall will not survive the town’s move. Within City Hall visitors can view plans for Kiruna’s new city center, including the new city hall. The clock tower of City Hall will be saved and will be a highlight of the new town center. Artist rendering of new city hall and city center. While moving an entire town is an incredibly difficult and expensive endeavor, the upside is that Kiruna will be a more beautiful town with a bustling city center with shops, hotels, homes, and public spaces. Once the move has been completed, which could take 20 years, a park will be created where the old town once stood. If you’re planning on staying in Kiruna, we suggest Camp Ripan, a lovely hotel on the outskirts of town, but within easy walking distance, even in the winter. To learn more about Camp Ripan, its restaurant, its spa, and its Northern Lights viewability, read our article about five awesome hotels in Sweden. Thank you to Kiruna Lapland and Camp Ripan for hosting our time in Kiruna and making this post possible. As always, all opinions are my own.